What: Realistic fires combat with vaporized water and class B foam. 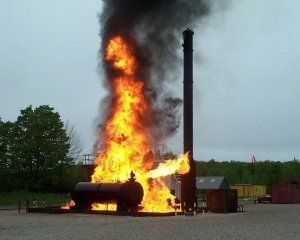 Since 2009, Drago-ISI Inc. design and manufacture the Drago Fire Spression cannon, a major innovation in fire fighting ! The Drago canon allows to shoot much more efficiently and saves as well water and/or class B foaming agent used during fire fighting! Why the Bruce Power Training Site? Bruce Power operates the largest operating nuclear power plant in the world and supplies approximately 30% of Ontario’s electricity. In 2015, Bruce Power added a 23,000-square-foot training facilities offering a variety of realistic scenarios for their firefighting team ! Registration required, Hurry! Limited places. Note: Indicate in the “Message” tab the names of additional guests. We are the guests of Mr. Jean Labrecque Director of the fire department of the Municipality of St-Claude. Come see the Drago in action! The presentation given by Mr. Eric Bedard and Mr. Simon Villeneuve aims to explain the technology behind this gun and you demonstrate in situ. This gun could help answer many difficult situations during a fire. The company Drago-I.S.I. (Engineering & the Fire Safety) founded in 2008 and finalist for the 2009 young entrepreneur at the MRC of Sainte-Thérèse-de-Blainville. The company specializes in research, development, design and manufacture of fire extinguishing gun called “Drago”. The “Drago” is a major innovation in the field of fire fighting, because we offer a multifunctional variable configuration barrel for projecting a water / air or foam sprayed over large distances and very extensive with a high or low water flow to effectively operate several maneuvers to extinguishing a fire, cooling the air and / or smoke repulsion. Following tests in recent live fire exercises, we can confirm that the “Drago” will be used in 14 modes or tactical operations or for extinction, cooling / protection and dispersion / ventilation. These 14 modes or operations of tactical cover virtually the entire combat modes modern fires. The “Drago” embedded trailer is quick to deploy, easy to use and safe in operation. . The concept of the barrel allows enormous heat absorption capacity (75%) to lower the flame temperature and consequently the intensity of the latter. Also, we have reduced the use of water 3X superior fire spears.